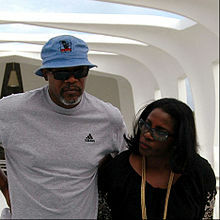 Samuel L. Jackson and LaTanya Richardson during a tour of Naval Station Pearl Harbor. LaTanya Richardson (born October 21, 1949), often listed as LaTanya Richardson Jackson, is an American actress and producer. She began her career appearing in off-Broadway, before playing supporting roles on television and film. Richardson has appeared in films include Fried Green Tomatoes (1991), Malcolm X (1992), Sleepless in Seattle (1993), When a Man Loves a Woman (1994), Losing Isaiah (1995), Lone Star (1996), U.S. Marshals (1998), and The Fighting Temptations (2003). Her television credits include Show Me a Hero, Luke Cage, and series regular role on the BET crime drama Rebel. She was born in Atlanta, Georgia. While a student at Atlanta's Spelman College (the second oldest college for black women in the US) in 1974, she met actor Samuel L. Jackson, then at all-male Morehouse College, who would later become her husband. She and Jackson married in 1980. They have one child, freelance film and TV producer Zoe Jackson, born in 1982. After her daughter's birth, Richardson stopped working regularly, because, she said: "We'd vowed to be an intact revolutionary black family. But it was very, very hard." To date, Richardson's biggest role in a motion picture was in the 2003 musical The Fighting Temptations in which she appears as the main antagonist, the hypercritical Paulina Pritchett. In 2014, Richardson was nominated for the Tony Award for Best Lead Actress in a Play for her 2013 performance in A Raisin in the Sun as Lena Younger, a role she took over at the last minute when Diahann Carroll dropped out due to health concerns. This was her second appearance on Broadway after her debut in the 2009 revival of Joe Turner's Come and Gone. 1989 A Man Called Hawk Doris Gilbert Episode: "Life After Death"
1991 Law & Order Lorraine Episode: "Life Choice"
1992 Law & Order Anne Houston Episode: "Sisters of Mercy"
1992 Frannie's Turn Vivian Episodes: "Pilot", "Frannie and the Kitchen Sink"
1993 Civil Wars Episode: "Hit the Road, Jack"
1993 Cheers Moderator Episode: "Woody Gets an Election"
1994 Party of Five Jane Gideon Episode: "Private Lives"
1994 Earth 2 Alex Wentworth Episode: "A Memory Play"
1995 Chicago Hope Mrs. Parnett Episode: "Cutting Edges"
1995 NYPD Blue Sister Cecilia Episode: "Heavin' Can Wait"
1997 Homicide: Life on the Street Lynette Thompson Episode: "Betrayal"
1998 Any Day Now Mrs. Walker Episode: "Call Him Johnny"
1998-1999 Ally McBeal Attorney Yvette Rose Episodes: "Story of Love", "Let's Dance"
1999 Judging Amy Lena Railsback Episode: "Pilot"
1999 Once and Again Counselor Episode: "Boy Meets Girl"
2003 Boston Public Sheila Episode: "Chapter 62"
2011 Harry's Law Noreen Episode: "In the Ghetto"
2012 Damages Judge Jaclynn Ellis Episode: "You Want to End This Once and for All?" ^ a b "The Tony Award Nominees - All Categories". Retrieved February 19, 2017. ^ "Rebel: John Singleton Scripted Drama Coming to BET in March - canceled TV shows - TV Series Finale". January 18, 2017. Retrieved February 19, 2017. ^ Pat Jordan (April 29, 2012). "How Samuel L. Jackson Became His Own Genre". The New York Times Magazine. ^ Gioia, Michael (April 12, 2014). "LaTanya Richardson Jackson and Kenny Leon Discover the "Dream" in Broadway's A Raisin in the Sun". Playbill.com. Retrieved September 27, 2014. ^ "LaTanya Richardson Jackson". TonyAwards.com. Retrieved September 27, 2014. This page was last edited on 8 March 2019, at 15:55 (UTC).